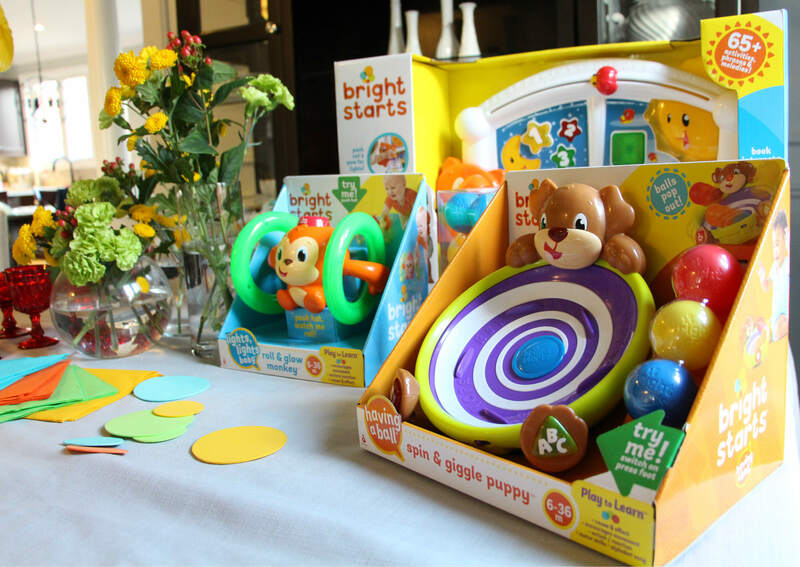 Recently, we had an opportunity to partner with Mom Select and Bright Starts to host a play date and try out some of Bright Starts newest and hottest toys. 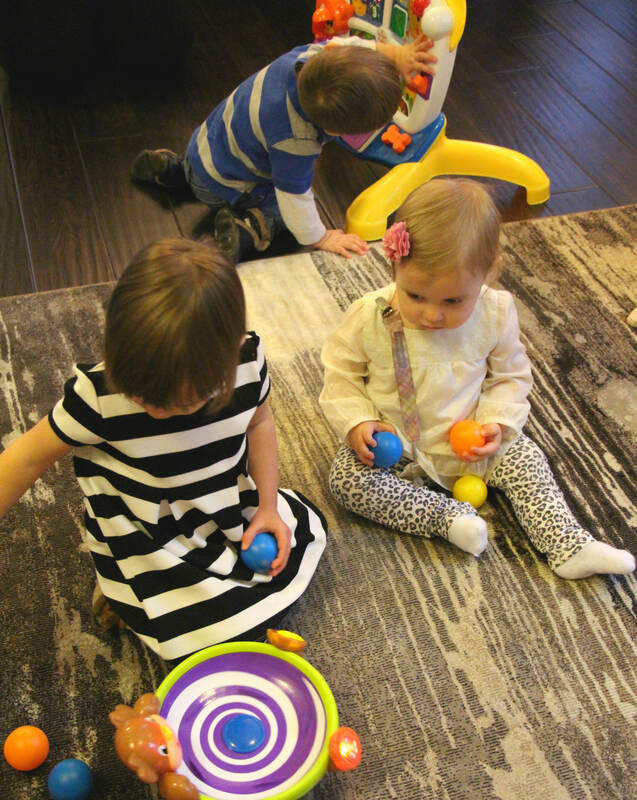 We excitedly sent out invitations to a few friends ranging in age from 6-36 months, (which is the recommended age for these toys). 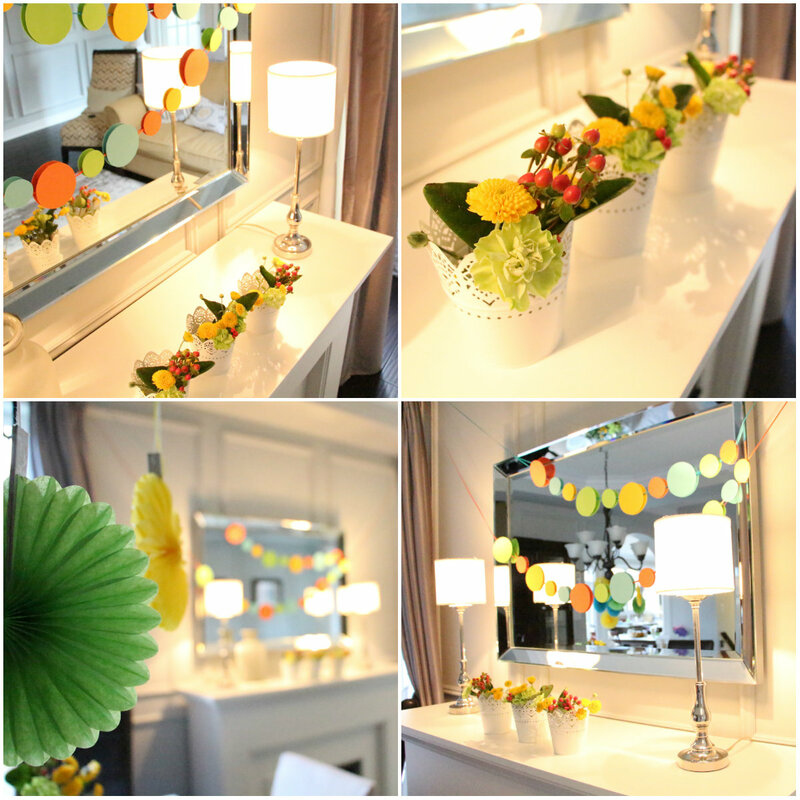 We also decorated our house for the occasion. The party couldn’t come fast enough. All day the kids kept peeking at all of those exciting new toys. Even the older kids were fascinated by them! 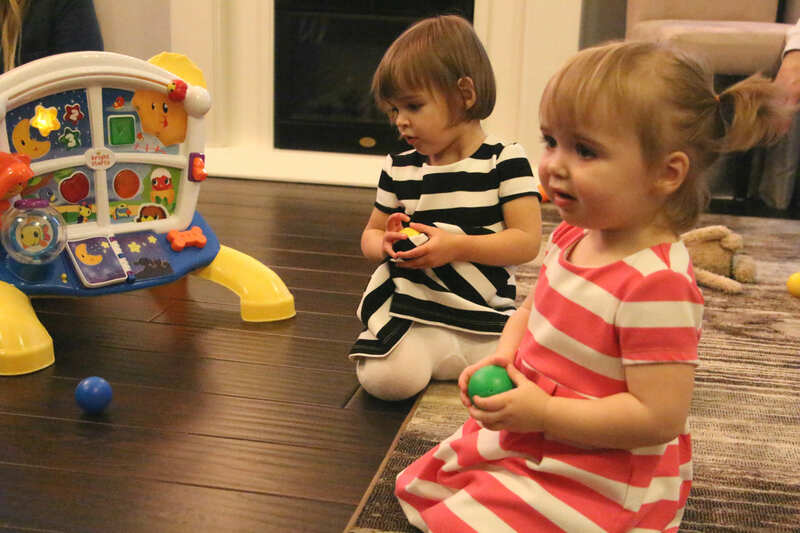 As soon as Mia and Everly’s friends arrived, we opened up the toys and began our play date. The Learn and Giggle Activity Station (pictured below) was a blast! There are so many things to do, including a musical book, a fun little cat and gold fish bowl, an interactive window pane and little switches and surprises around every corner. 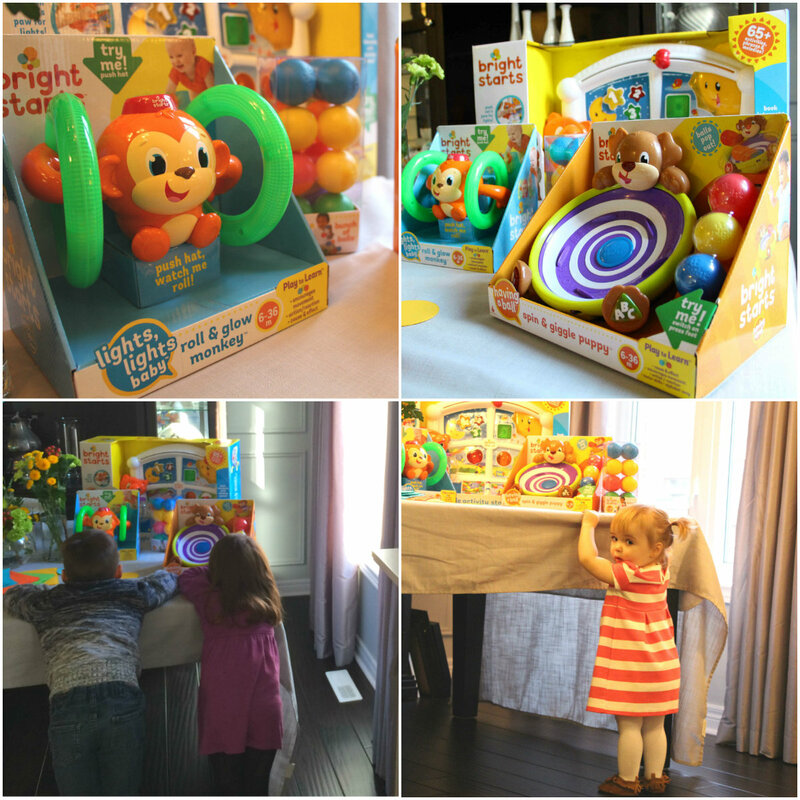 Our friend Cooper just loved the Roll and Glow Monkey. 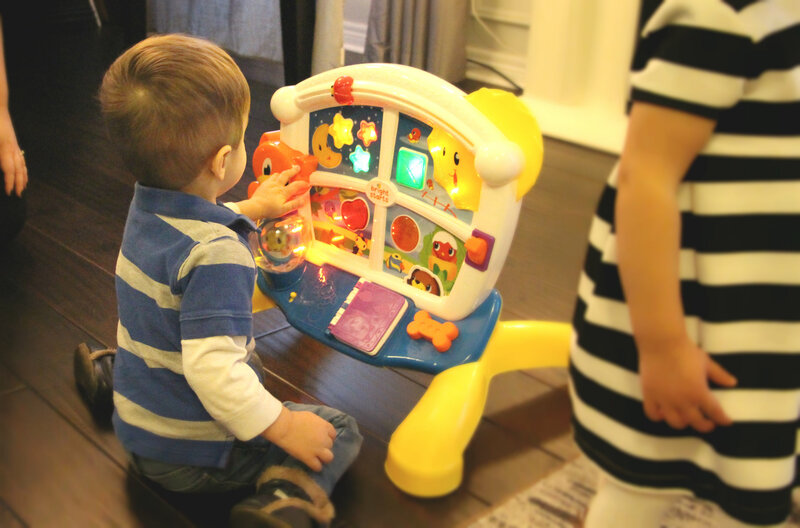 This light up toy makes music and rolls when you press the button. Even I had fun chasing the Roll and Glow Monkey around. 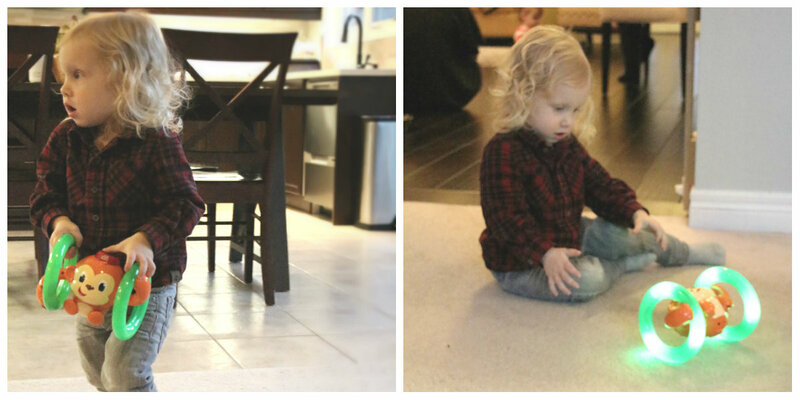 The Spin and Giggle Puppy was a popular toy at our play date too, especially with our youngest guests. Shaped like a bowl, it can hold many of Bright Starts’ Bunch of Balls. When you press the center button, it spins, sending the balls flying. It also lights up and makes music too! After all of that fun it was time to eat! 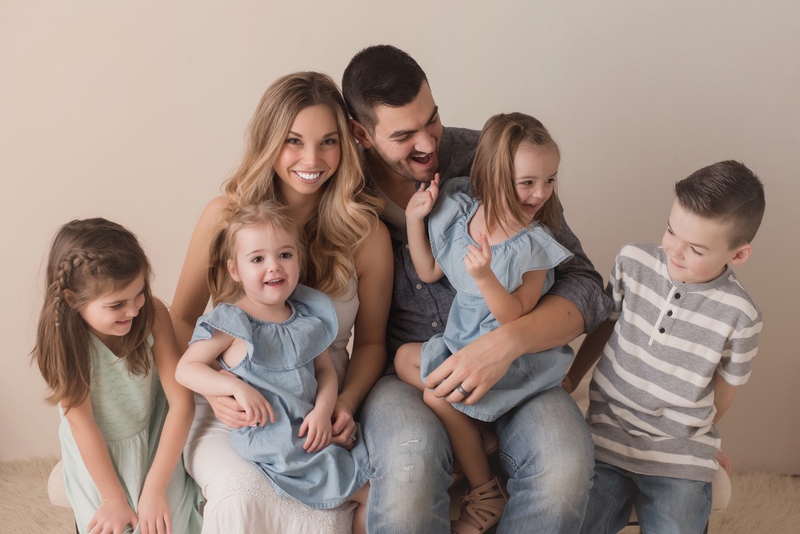 Bright Starts provided us with some delicious and easy playdate recipes for both kids and moms, which I have included below. But why eat at a table, when you can have a picnic on the floor! 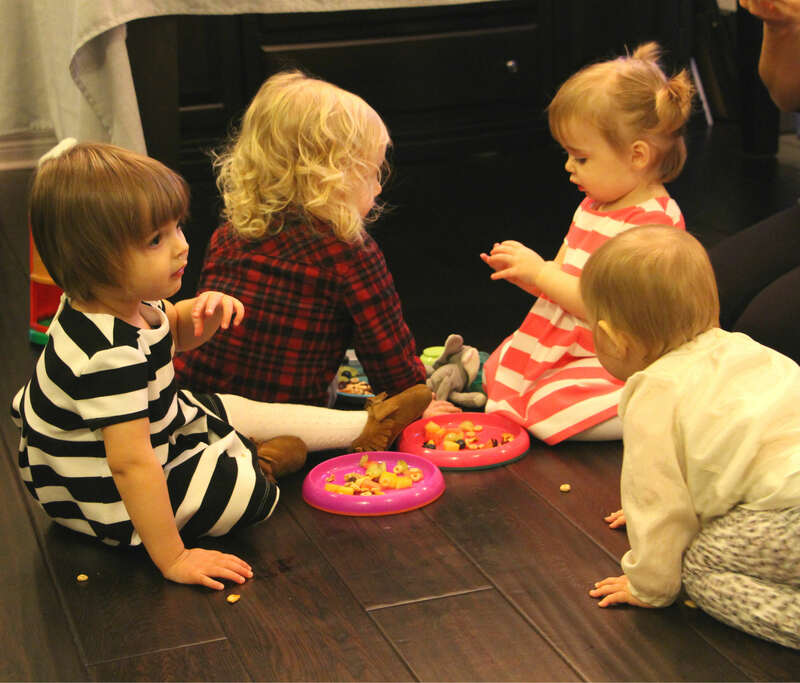 At the end of our play date, each of our friends got to bring home a special cookie. Everyone had a blast at our Bright Starts play date! What did we think of the toys? They were, and still are, a hit. Any of these would make a great gift for a child between the ages of 6-36 months. 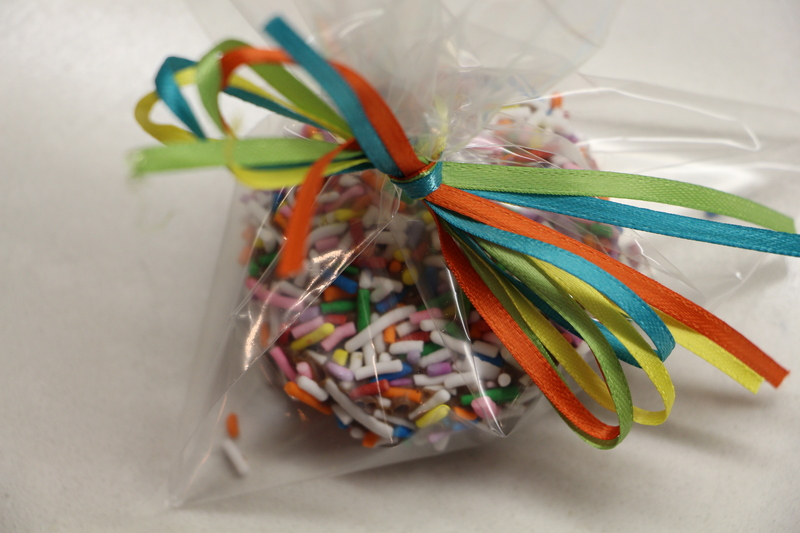 Bright Start Bars – Naturally sweet and easy to eat, these make excellent finger foods for little ones! Directions: 1. Preheat the oven to 350 degrees and spray a baking sheet with cooking spray. 2. In a medium bowl, mash the banana to a smooth consistency, using a fork. 3. Add the oats and applesauce to the banana and stir until combined. 4. Stir in the raisins/cranberries and cinnamon, if using. 5. Using your hands, form the mixture into bar shapes on prepared baking sheet. 6. Bake for 10-12 minutes or until firm. 7. Allow to cool before serving. 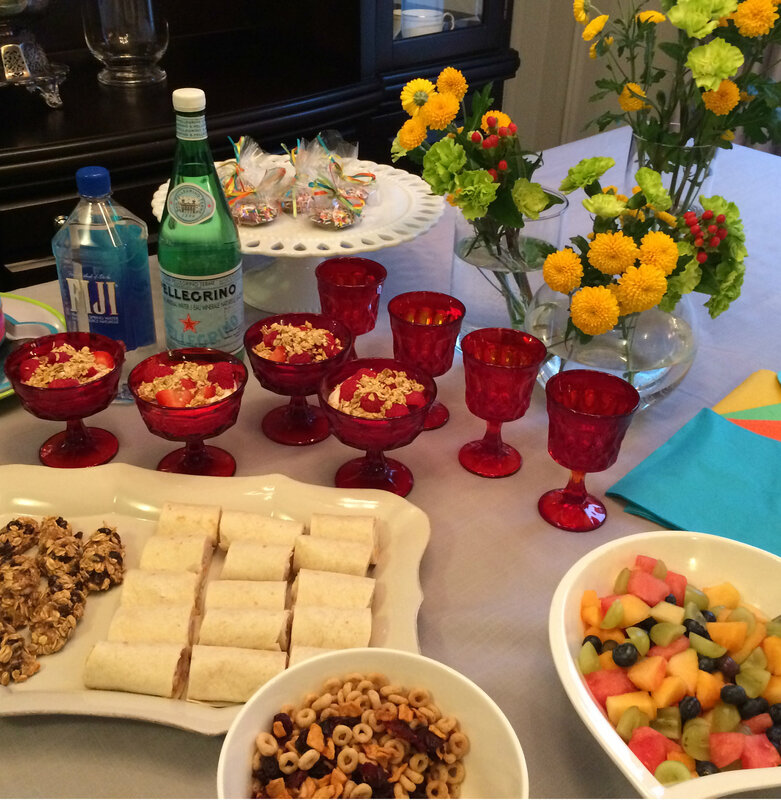 Play Date Parfaits – Creamy and sweet, these parfaits were a hit with both moms and kids! Directions: 1. In a large glass, layer 1/2 cups yogurt, 1/4 cup granola and a handful of berries. 2. Repeat laters. 3. Serve immediately. 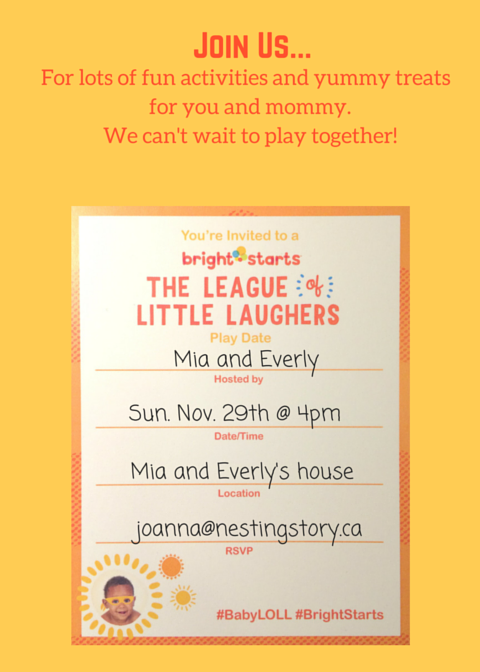 Nesting Story received free products in order to host the Bright Starts sponsored Play Date. The opinions expressed here are my own.